It’s only 16 days until the Goodlife Fitness Marathon in Victoria, BC. On October 9th, I’ll run 42K with my dear friend Jody, from Leapfit and celebrate with my friends and family from Kamloops, BC and Fort Saskatchewan, AB. They will run the half marathon, cheer for each other and accomplish their goals. What a glorious day it will be!!! My book is in the final stages and I have to say, I really love it! It’s been a year of hard work, but I think you are going to love the end result. I can’t wait to share it with you! Can I really be any more excited? Yes! My birthday is in two weeks and I’m excited to turn 42! Each day is a blessing and I have such GRATITUDE for the life I am now living. It was not without a lot of soul searching and soul healing but now my life is divine and I’m really excited for the year ahead of me! I HAVE CONTROL OVER THOSE THOUGHTS! So, do I want to invest and nurture those doubts, anxieties and worries or do I shut them down? Replace them with POSITIVE, NURTURING, LOVING and EXCITED thoughts! 1. I visualize the beautiful sunny day and the gorgeous route along the ocean, which I love so much. 2. I think of how much FUN I am going to have with my friends and family the days before and the day of the run. 3. 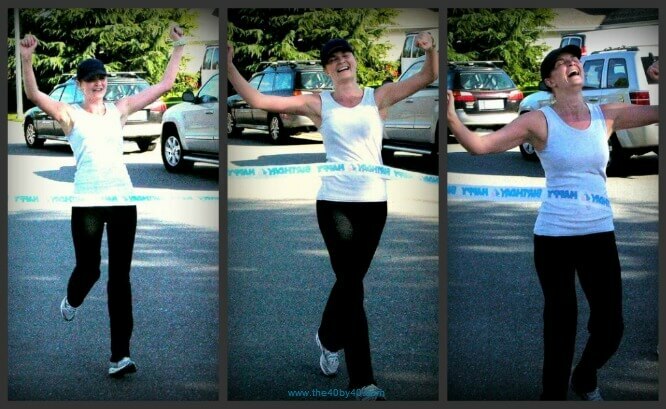 I think of the sheer JOY I will feel when I cross that finish line and I tear up thinking of my friends and family being there to cheer me on. It’s such a remarkable accomplishment whether it’s a 5k, 10k, 21k or 42k race. It takes hard work, commitment, dedication and sacrifice and I can’t wait to feel that enormous pride of crossing the finish line! I DID IT!! Ya-hoo!!! 4. Any concern I have of tight calves, nausea, pain in my hip or my feet burning I focus on seeing myself running with a SMILE on my face, a JOY in my heart, and feeling GOOD and STRONG. 5. I visualize what I want to see happen, not what I am worried about happening. 6. POSITIVE energy and words replace negative energy and words. 7. JOY and GRATITUDE replace fear and anxiety. I am not running for time, I am running for FUN. I am running to CELEBRATE one more year of processing any remainder pain that may have been lingering inside of me. I am running 42 kilometers to CELEBRATE my 42nd birthday. Hope you have a blessed weekend full of meaningful conversations, quiet moments of peace and loud boisterous laughter! See you on Tuesday!